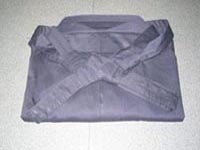 Hold the Hakama open, with the back of the Hakama under your chin. 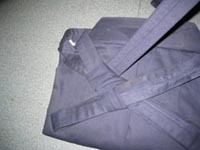 Pull the inseam over to the right a bit, then close the Hakama. 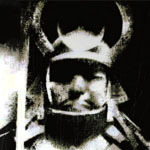 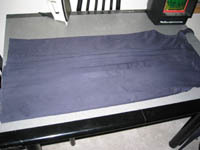 Lay the Hakama on a flat surface, face down. 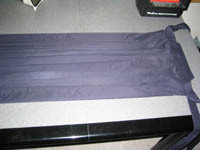 Push the two sets of belts out of your way and flatten the Hakama as best you can. 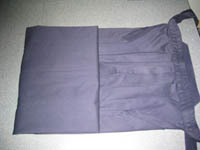 There are two pleats on the back of the Hakama, one on top of the other. 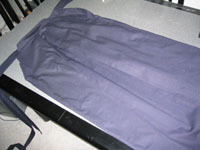 Pull the top pleat aside down the length of the Hakama exposing the one underneath. 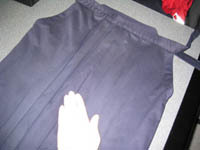 Straighten the pleat that is now exposed along the entire length of the Hakama making sure it is centered. 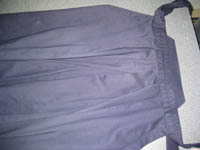 Bring the top pleat back over on top again and straighten it in the same way as the last one. 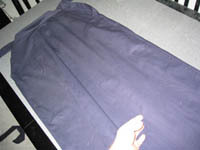 Now carefully turn the Hakama over so the front is now facing up. 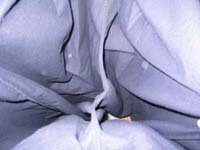 Be sure to keep the two back pleats intact. 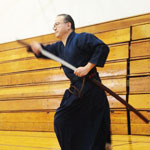 This takes practice! 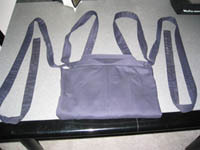 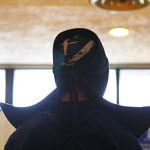 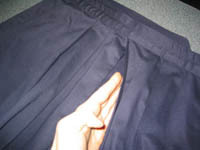 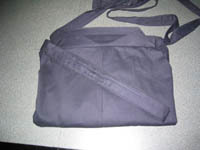 There are five pleats on the front, and similar to those on the back some of them are on top of the other. 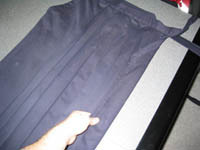 Locate the center of the Hakama and fold back the set of top pleats to expose the ones underneath. 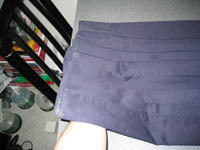 Now, bring the top pleats back to the center and straighten those. 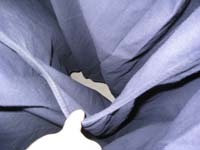 Run your hand down the length of the Hakama to help flatten out any bulges. 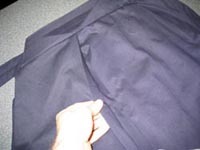 This also serves to remove any obvious pieces of lint or dirt. 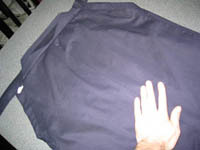 Fold the outer edge of the Hakama in towards the center. 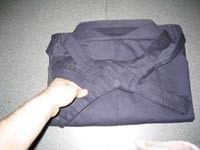 Make sure this fold is of the same width all the way down the length of the Hakama. 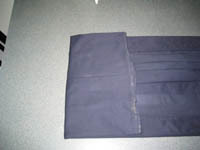 The width of this fold should be such that the crease it makes is directly in line with where the belts attach. 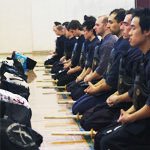 Repeat this on the other side of the Hakama. 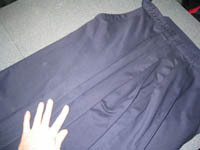 Carefully slide your arm underneath the bottom of the Hakama being careful not to disrupt the two pleats on the back side. 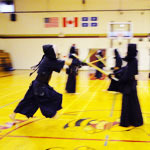 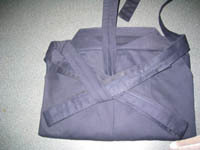 Flip the Hakama forward, folding up about 1/3 their length. 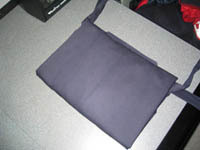 Slide your arm under the bottom again, and fold up the Hakama by another 1/3. 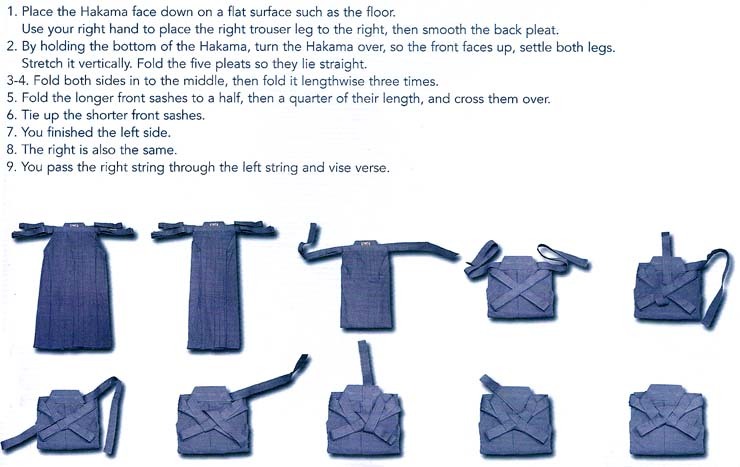 Carefully turn the Hakama over again so that the back is face up and separate the two sets of belts. 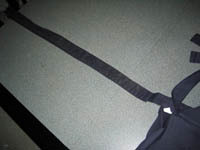 Take one of the long belts and fold it in half onto itself. 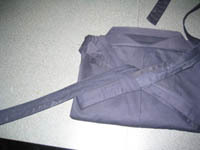 Fold the same belt in half onto itself once again. 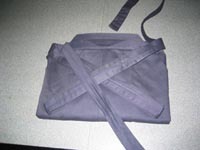 Take the folded belt and lay it across the Hakama, diagonally across the center. 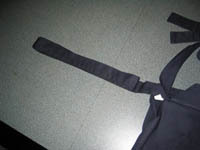 Repeat this for the long belt on the opposite side so that it makes an "X" over the Hakama. 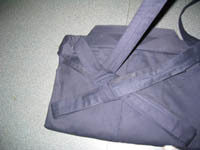 Take one of the small belts and lay it over the center of the "X". 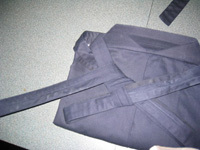 In this case I start with the left belt. 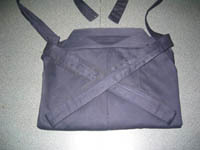 Now bring the short belt under the center of the "X". 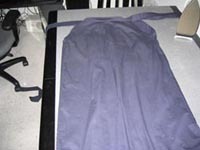 Now fold the short belt diagonally over the top of the left descending arm of the "X". 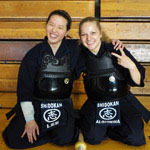 Had I started with the short belt on the right, I would fold it over the right arm of the "X". 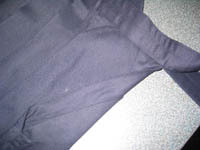 Bring the belt under and back over this same part of the "X" twice. 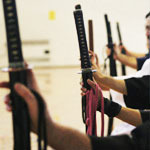 Repeat this process for the other short belt. 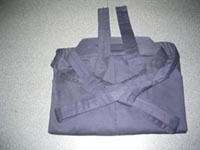 Bring the short belt on the left diagonally across the center of the "X" to the right and through the loop made on the lower descending arm of the "X" on the right. 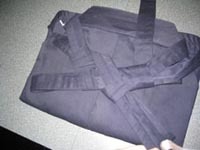 Repeat this step for the short belt on the right, bring it through the loop on the lower part of the "X"'s arm on the left. 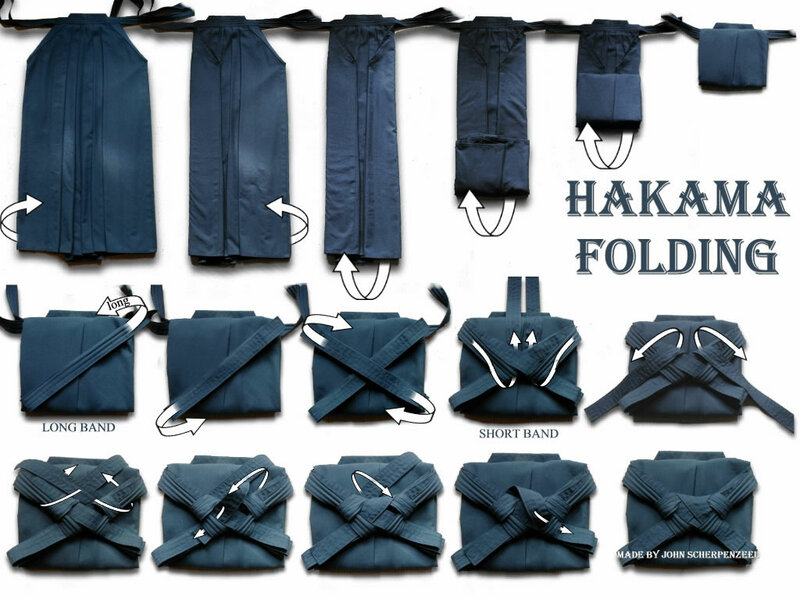 Your Hakama is now folded!